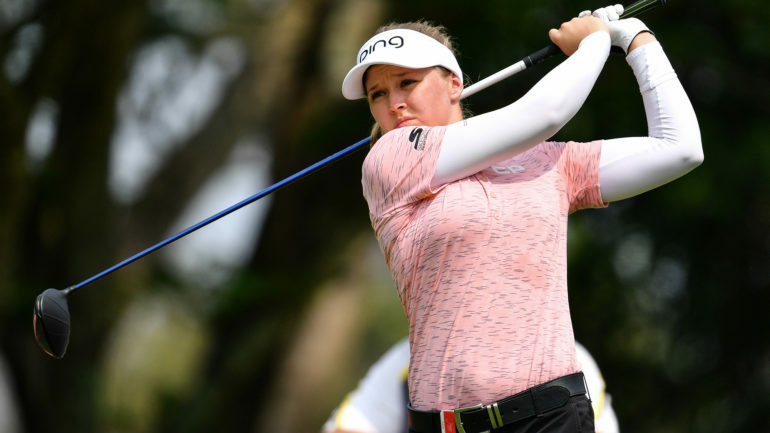 CHONBURI, Thailand – Canada’s Brooke Henderson is three shots behind leader Eun-Hee Ji of South Korea after shooting a 6-under 66 in the opening round of Honda LPGA Thailand on Thursday. The bogey-free day marked Henderson’s first competitive round since the season-opening Tournament of Champions in Florida ended on Jan. 20. The 21-year-old native of Smiths Falls, Ont., sat out the last two events because of illness. Henderson is in a four-way tie for fifth. Ji has a two-shot lead on Minjee Lee of Australia, Danielle Kang of the United States and Jenny Shin of South Korea. Henderson tied for seventh at this tournament last year. Ji won her fifth U.S. LPGA Tour title in her previous event last month, the Tournament of Champions. She picked up right where she left off, in Chonburi. After an opening birdie and a bogey on the third hole, Ji birdied nine out of the following 14 holes on the Siam Country Club Pattaya’s Old Course. “I felt really great. I didn’t miss any fairways and missed just two greens,” Ji said. “I have a lot of confidence. Lee was bogey free as she eagled the 15th and birdied five holes on a humid day. “I was little bit slow starting out. I finished with three birdies on the last three holes at the front nine, and got a little bit better momentum,” Lee said. World No. 1 Ariya Jutanugarn, the 2013 runner-up, carded a 4-under 68, mixing an eagle and six birdies with two bogeys and a double bogey.